1. Stamp Joy Tree with Onyx Black ink and color the large letters, stars and hearts with colored pencils. 2. 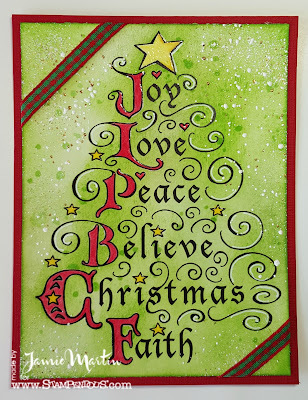 Using a VersaMarker, color over the letters, stars and hearts then sprinkle with clear embossing powder and heat. 3. Sprinkle panel with Shabby White Embossing Powder and heat from underneath so the powder doesn't blow off. 4. Wrap corners with ribbon and glue to a Firecracker colored card. So pretty! I love that this stamp with a pretty background makes such a fantastic card! Simple and lovely! TFS! Merry Christmas! This is super pretty! I love your background. Hi Jamie, Fabulous embossed christmas card with traditional colours. Thanks so much for applying at Season's Greetings DT Call.